British Asian designer Samaira Ghani has just launched her new collection for 2014 "Fleuri". Here's a closer look at the collection! I first came across the brand when I saw this teaser video for the collection and it definitely got my interest! Samaira Ghani Fashion Film 2014 from Moonlight on Vimeo. Whilst the video and the title "Fleuri" might give you the impression that this collection is all about florals, that's not the case - the outfits have been inspired by different shapes and textures in nature, not just flowers! This outfit was the one that immediately stood out to me - I love emerald green and I like jackets on asian outfits so you can see why I liked this so much! I love the texture of this next lengha. I don't think the wrapover top would be to everybody's taste, but it demonstrates SG's eye for creating a fusion of eastern and western styles. SG said she also took inspiration from her own mother's wedding wardrobe, using the embroidery as a starting point and reworking it with her own contemporary influences. From looking at the colour palette of the whole collection, I can imagine most of the separate pieces can be mixed and matched, for example pairing the peplum top above with the black palazzo pants. I really like the idea of having separates that you can wear with other things in your wardrobe! 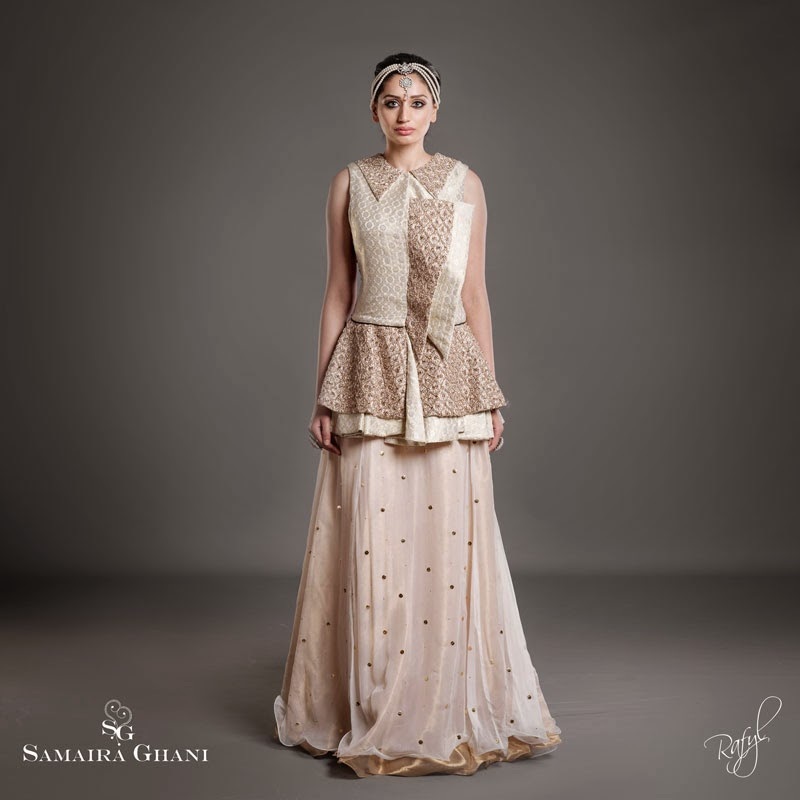 Samaira Ghani is based in Nottingham and the collection is available to view by appointment. Prices ranged from £390 up to £1000. For more information and to make an appointment, visit the SG Facebook page.